The B.A.A. 5K began in 2009, and became an instant hit among runners from far and wide. Viewed by many as the “calm before the storm,” the Sunday of Marathon weekend traditionally was for shopping, loading up on carbohydrates at the pasta dinner, and most importantly- resting. But now, runners of shorter distances, and even a few marathoners looking for a last-minute tune-up are taking to Boylston Street in anticipation of the big day. The race helps people get into the running spirit of the weekend, and offers the unique opportunity to cross the Boston Marathon finish line in front of hundreds of cheering spectators. The 5K (3.1 mile) flat, loop course begins on Boylston Street at the Copley Square fountain, near the intersection with Clarendon Street, and ends at the finish line of the Boston Marathon. 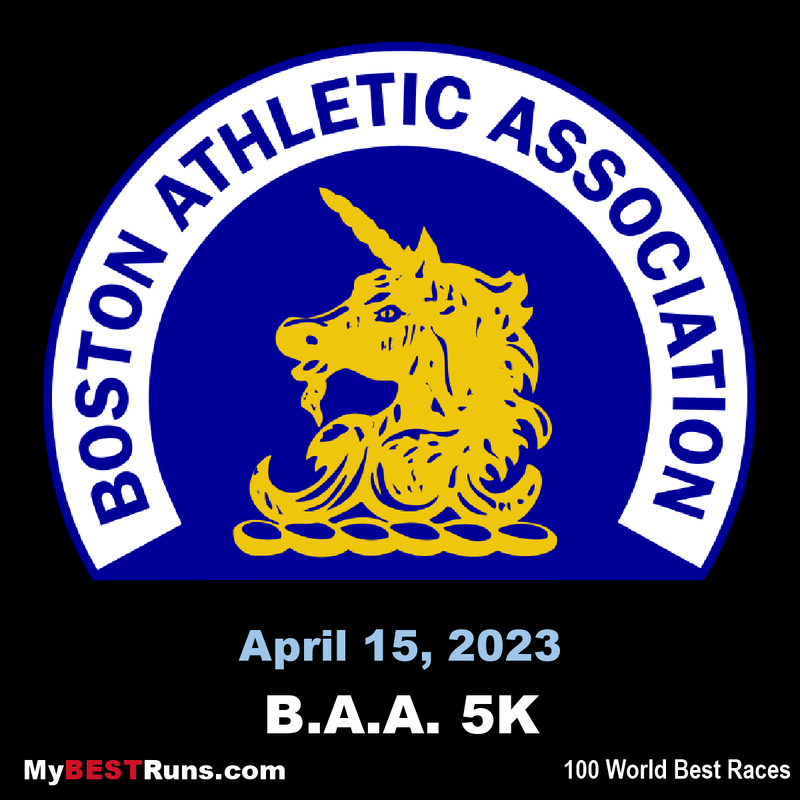 Now ten years old and with more than 8,600 runners on the starting line, the B.A.A. 5K is a fixture of the New England racing scene and an integral part of Boston Marathon Weekend. It’s also a key part of Ben True’s annual racing calendar. True had won four times, twice setting a U.S. national record. A year ago he clocked 13:20 to awe the crowd. True arrived on the Charles Street starting line with every intent of claiming title number five. However, a stellar field of U.S. and international roadsters would make very difficult. Conditions were almost perfect – a light breeze across Boston Common and temperatures in the low 50s - and through the opening mile of 4:32 a pack of 20 held close formation. American Tommy Curtin fronted a group of 20 that included True, Daniel Salel, Eric Jenkins, Philip Langat and, almost hidden, Hagos Gebrhiwet – the 2016 Olympic 5000m bronze medalist. Approaching the u-turn on Commonwealth Avenue near 1.5 miles, the large group hung together with Curtin at the forefront, and then - after the turn - Langat taking a turn in the lead. But the gang was all there with scarcely any daylight between them. It was the right turn off Commonwealth Avenue onto famed Hereford Street that saw the first gaps appear. Langat held the pole position, but the uphill grade saw the group start to spread. The leaders - Langat, True, Jenkins and Salel - passed two miles in a moderate 9:01. Almost immediately the left turn onto Boylston Street shook things up. This year, it was a slow and intense burn down Boylston that determined the top finishers. Through the fabled Boston Marathon finish line, the pack was down to twelve with True, Jenkins, Langat and Curtin at the forefront with Gebrhiwet moving into position. This was where things began to get tense. With the left turn back onto Charles Street and the finish line approaching, Gebrihwet inched into a two stride lead with True, Curtin and Jenkins working valiantly to maintain contact. The left turn came, but the leader didn’t make it. The other contenders swung into the home straight without incident, hoping to take advantage of the leader’s misstep. But, while Gebrhiwet’s mistake was significant, it wasn’t fatal. Hurtling towards the line, he inched alongside the leading trio and then surged for home. At the line, the clock read 13:42 for the Gebrhiwet, with True in second and Curtin third; they all had the same finishing time. “When I lose on a sprint, I’m always disappointed,” commented True. Coming into the B.A.A. 5K, defending champion Buze Diriba had won seven U.S. road races – including last week’s Cherry Blossom 10-Mile – since she broke the tape on Charles Street last year. Suffice it to say, the 24-year-old Ethiopian toed the line as the favorite, and she lived up to the billing, outkicking countrywoman Fotyen Tesfay and Kenya’s Monicah Ngige under sunny skies to win in 15:22 and take home the $7,500 top prize. Tesfay, just 20 years old, was second in 15:23 ($4,000), with Ngige third in 15:24 ($2,500). Finishing as first American was Molly Seidel, fifth in 15:33. 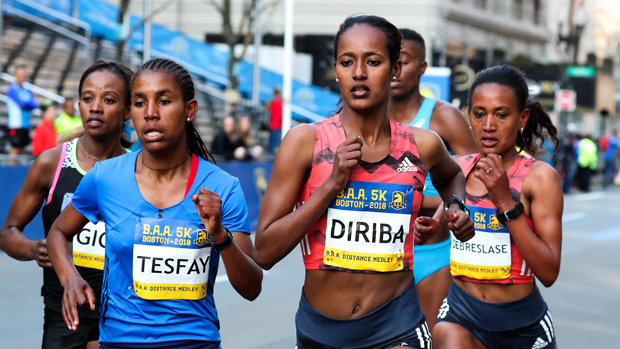 “Yes, I have a confidence,” said Diriba, through a translator, when asked if she thought coming down the homestretch that she would repeat her 2017 victory. A huge pack went through the first mile in a brisk 4:52 before slowing a bit in the second mile. At the 2-mile mark, nearly a dozen women were still in the jostling lead group. Then the whittling began. Then, with about 400 meters remaining down Charles Street between Boston Common and the Public Garden, Diriba and what would become the rest of the podium launched their kicks. Tesfay said she thought right until the last moment that she could catch Diriba, but it was not to be. Winning the masters division was 41-year-old Tara Wilson of West Islip, N.Y., while Vanessa Cris De Souza of Brazil won the wheelchair division in 12:32. Among other notable women running the tenth-annual B.A.A. 5K were 1984 Olympic marathon gold medalist and two-time Boston Marathon winner Joan Samuelson (24:12); Kathrine Switzer, who in 1967 became the first woman to officially run the Boston Marathon (33:52); 2008 Olympic gold medalist gymnasts Shawn Johnson East (26:54) and Nastia Lukin (30:51); and 2013 Boston Marathon bombing survivors Adrianne Haslett (28:14) and Roseanne Sdoia (1:04:16). The race begins on Charles Street and proceeds right onto Boylston Street before taking another right onto Arlington Street. Participants then take a left onto Commonwealth Avenue, eventually passing the one mile mark. Reaching Charlesgate West, runners will turn around onto the inbound side of Commonwealth Avenue and follow the Boston Marathon race course, taking a right on Hereford Street and left on Boylston Street, ultimately passing over the Boston Marathon finish line. Participants will continue down Boylston Street before taking a left on Charles Street for the finish between the Public Garden and Boston Common.